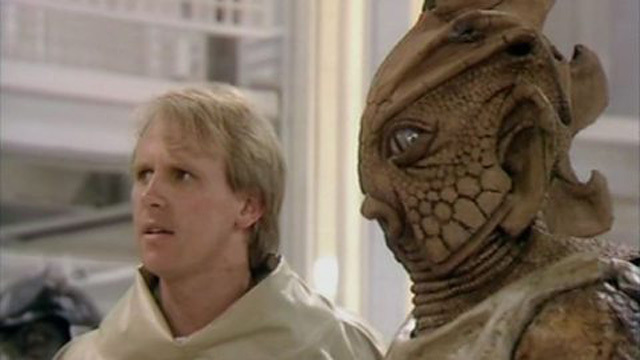 The opening to Season 21 of Doctor Who, which proved to be Peter Davison's last as the Fifth Doctor, promised so much - Warriors Of The Deep serving as return appearances for not one but two reptilian foes as the land-based Silurians, now looking slightly different and perhaps a subgroup from those the Third Doctor came across during events at Wenley Moor, and their Sea Devil cousins teamed up in an attack against humanity, both species having been betrayed/defeated by the apes calling Earth theirs two selves ago from the Doctor's point of view. So just why is it mostly remembered for being a bit pants and seemingly condemning the Sea Devils to exile from further appearances in televised Doctor Who? 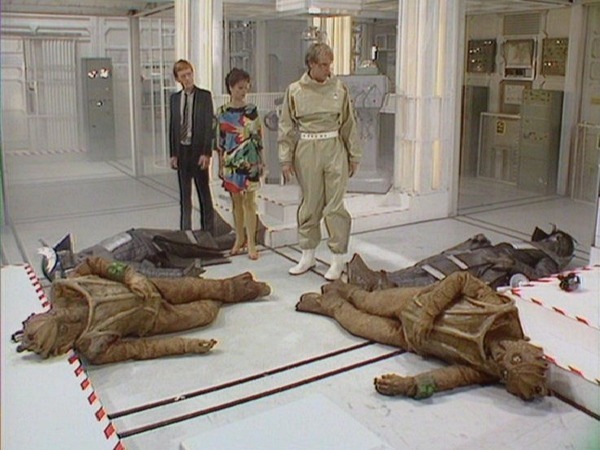 After all, the Silurians were eventually woken from their enforced slumber in The Hungry Earth/Cold Blood, but what put them to sleep in the first place? It's perhaps bad timing, broadcast as it was during the beginning of the end for the third Cold War (1979-85) and the start of a fourth (1985-91). So you can begin to see just why the idea of a similar situation in 2084 might have got some critics a little worried. TEGAN: Little seems to have changed since my time. DOCTOR: Absolutely nothing, Tegan. There are still two power blocs, fingers poised to annihilate each other. Hexachromite. TURLOUGH: What do they use that for? DOCTOR: Hexachromite gas. It's part of a sealing compound for undersea structures. It's lethal to marine and reptile life. I thought they would have banned it by now. TEGAN: Progress doesn't seem to have solved anything. 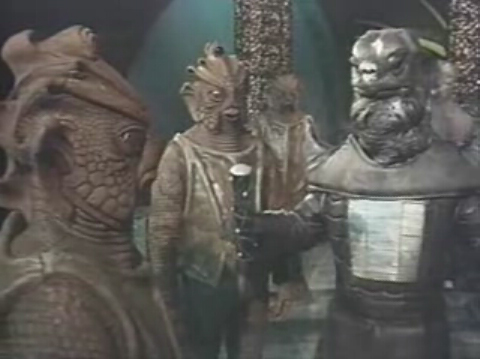 And tragically that Hexachromite will prove to be the death of almost every member of the Silurian and Sea Devil forces inside the underwater Sea Base as the reptiles seek retribution, with the Doctor forced to turn it on them after they've made light work of their warm-blooded opposition. Within the alliance it seems the Eocenes/homo reptilia are something of an officer class, led by the Triad of Ichtar, Scibus & Tarpok, whose previously deadly third eyes now appear to have become glorified headlights, flashing only when they speak. Their footsoldiers are the Sea Devils, commanded by Sauvix- who've swapped the odd fishnets of their début alongside the earlier Doctor & the Master for something resembling samurai armour. "For hundreds of years our Sea Devil brothers have lain entombed, waiting patiently for this day. It concerns me that they did not wake up as we had planned in the first place." Surely the first case for their future return to Doctor Who lies with the speed at which they are shown to have revived following a lengthy hibernation, similar to both the earlier and later Silurians awakened from their Derbyshire caves and that drilling project in Wales respectively? "Battle orientation automatically commenced the instant we were revived." They probably reckoned without the intervention of the man they had known of old, who has to explain himself to their Silurian officers! DOCTOR: Yes. I thought he'd been killed. ICHTAR: Remove these people from the bridge. DOCTOR: You do not recognise me now, but we are known to each other. ICHTAR: You are mistaken. Take him away. DOCTOR: No, wait, wait, please. In an earlier regeneration you knew me as the Doctor. ICHTAR: The Doctor? You can prove what you say? DOCTOR: I know that you are Ichtar, the surviving leader of the noble Silurian Triad. When we last met I tried to mediate between you and the people of Earth. ICHTAR: So it is you. As you might expect, it's the Doctor who has to play the diplomat. But it seems the Silurians have a plan of their own, which Ichtar rather carelessly reveals to him- perhaps the memory of his race's earlier attempt to broker peace between they and the humans prompts the revelation that since then they've found a new and incredibly cunning means to gain revenge on those who'd wronged them then. ICHTAR: You forget. Twice we offered the hand of friendship to these ape-descended primitives, and twice we were treacherously attacked, our people slaughtered. It will not happen again. DOCTOR: There can be no alternative to peaceful co-existence. ICHTAR: There is, Doctor. A final solution. DOCTOR: Genocide? When everything you Silurians hold sacred forbids it? ICHTAR: We will harm no one. These ape primitives will destroy themselves. We, Doctor, will merely provide the pretext. DOCTOR: You'll trigger the war this Base was designed to fight. ICHTAR: Yes. And these human beings will die as they have lived, in a sea of their own blood. And they have a secret weapon in the form of the Myrka, a massive reptilian horse. "The Myrka looks simply terrible, and the scenes in which various members of the cast try desperately but unsuccessfully to appear afraid of it as it lumbers toward them at nothing more than a snail's pace are either deeply embarrassing or highly amusing, depending on the viewer's disposition." "The Silurians and the Sea Devils should have aroused our sympathy by themselves, through their words and actions; instead the Doctor half-heartedly encouraged everyone to have some respect for them, while they singularly failed to provide a good reason why anyone should." In light of which the final curtain on the whole mess just adds to that sense of disappointment. But if the Silurians can be resurrected after so long and bloody a battle, what's stopping the Sea Devils rising from the deep once more? "There should have been another way." ...and perhaps one day, there will. Yes, one day. In the meantime, #OhIDoLikeToBeBesideTheSeaDevils!